AGE 20 – 23…..FAITH STORY…. I was brought up in a Taoist background. At the age of 20, I got to know a group of catholic friends who neither preached nor asked me to attend Mass with them. I admired their respect, generosity, and kindness extended to me as a friend. At that time, I also had a boyfriend who was a catholic. Once in a while I would attend mass with him but always felt so bored. One day, I happened to be near by a church, I decided to sit in the church and take a rest while waiting for the next appointment. As I was sitting on the pew, looking at the crucifix, I felt this tremendous peace flowing within and around me. I had never experienced anything like this before. It was truly amazing. With this experience, I began to tell myself that there must be something in this religion. I wanted to find out more. I started to enquire about the catechism class and enrolled myself. I began to go through catechism classes. After about a year, I felt that I did not know the faith and bible well enough and wondered if I should get baptized. But, being a “kiasu” Singaporean, having spent many Fridays attending the classes, I told myself ought to go ahead and be baptized. Meantime, I had put my first faith experience at the back of my mind. As regard to the relationship with my boyfriend, it did not work out. As I look back, wanting to get baptised was probably a mixed motivation.After a year of baptism, I developed signs of boredom and questioned about my commitment to this faith. At the same time, sense that aloneness within. Something was missing!!!!! Aware of the commitment I made in this faith, I went to ask a priest if he could do something for me, like “de-baptise” me (if there is such a word) so that I would no longer need to go to church. He told me that once the baptismal seal was marked on my forehead, there would be no turning back. He advised me to participate in some form of church activities to know the faith community. I became a catechist. It was through teaching and attending bible courses, I came to know more about the church teaching and my faith. Meantime, I learnt the importance of prayer and how to pray. God sent people to lead and guide me. I had supportive catechists and there were 2 other young catechists as companion, to embark on this search for meaning and direction in life. 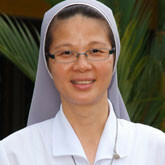 We met a Canossian sister and she began to journey with us. As God’s love grew stronger in me, I felt the desire, to make this God’s love known to all, especially those who have yet to experience him. I remembered my foundress, St Magdalene of Canossa said, “Make Jesus known and love. He is not loved because He is not known”. With the many faith experiences, followed by frequent reflections, I was constantly being challenged to make critical judgement on my experiences, to be aware what kind of values I am called to live. This entailed decision making that led to action. I saw God was inviting me to a particular way of life, yet unsure. Just then, I was invited to come and see what religious life was all about. But I had doubts since this way of life had never been known to me. At the same time, the fear of what my family would think, my feelings of unworthiness, my sinfulness. Many other questions came to my mind too. Was God really calling me to religious life? Or was it only my own imagination? Maybe it was my own fear of commitment? There were many “Maybes” and “what ifs”. I even calculated the risk involved, such as my career, freedom, etc. Eventually, with God’s grace and courage, I went through a discernment process, took the risk, plunged into the deep – to enter religious life. This process led me to experience the inner freedom within and to trust in God. Experienced and settled into the convent life, face with challenges, yet joy and peace followed. Signs from God……yes I’ve called you. DIFFERENT PHASES OF LIFE IN CONVENT…. I continued to enjoy the formation of personhood, prayer life and the support of the community that led to the effectiveness of apostolic/ministry. I began to see that as a community, we lived so closely with one another, we rubbed each others’ shoulders. It was and still is challenging. Ironically, I come to know myself more and more through community living and mature in faith. In this phase, many things had happened me. Now as I look back, it was a purifying stage for me. After 2 years of novitiate, I decided to take a year’s leave to discern further. A year outside the convent had helped me to see what had happened to me then. Where was God in that journey, the different aspects that he wanted me to grow. With the grace of God, I was able to see, be aware and humble of my flaws, to allow God to shape me through people and events. I also learnt acceptance of self and others at another level. After a year’s leave, I returned to convent and continued my formation. God’s love and hope to all. I made my final vow in the year 2006. Till today, I am convinced of my calling as a Canossian. I thank God for the grace and gift of faith and vocation on this earthly journey. Thank you father for the opportunity to share and thank to all of you for listening patiently. God bless.